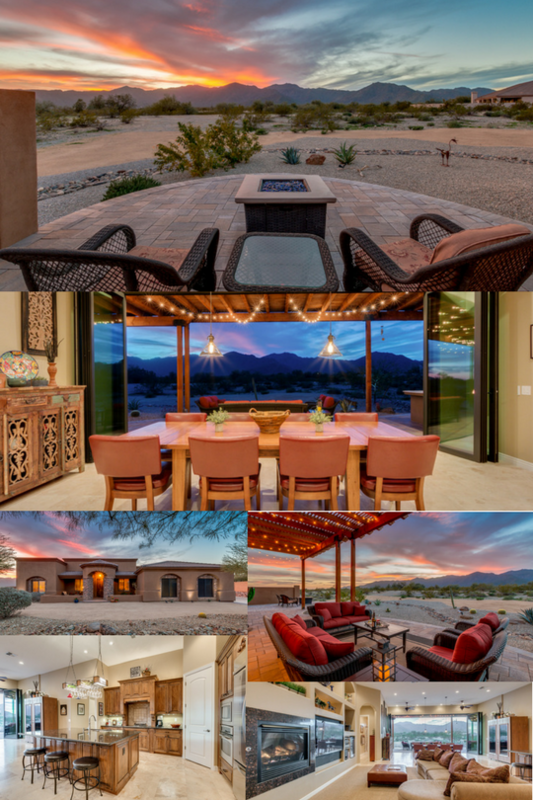 Luxury custom home w/captivating views of the White Tank Mountains & impeccable attention to detail throughout. The showpiece of this magnificent home is the unique 10x20 wall of windows that slides to either side, bringing the outdoors in. The backyard is an entertainers dream w/fully engineered pergola, outdoor kitchen, firepit & extended paver patio. Great curb appeal w/desert landscaping & inviting paver courtyard. Open concept floorplan combining living, dining & family room, all with gorgeous mountain views. Gourmet kitchen w/SS appliances, custom chandelier, walk in pantry & R.O. drinking water system. Master suite has his/hers closets, walk in shower & large jetted soaking tub. 4 more bdr's & 2 more baths split.